-900Mhz 3DR telem radio (Net ID 3) connected to laptop running Mission planner. When everything is connected and powered on I can select between the airplane and tracker screen to control both and can see both on the screen. I can not help you getting the Ardupilot antennatracker to work. I started experimenting with it, while it still was at a low 0.x version. It worked for me in some versions and stopped working with others. I got 1.0 working on the bench with a simulated vehicle, but out on the field it was more or less erratic. Sometimes it would track quite good, but even during one flight day, after changing the lipo on my copter, it would stop working or do something completly random. So I gave up on it and switched my tracker to u360gts. Perhaps the antennatracker firmware gets some love from the developers in the future, but do not hold your breath. Thanks for the info, are you using u360gts with a Pixhawk? Do you like it? Is it really free? u360gts runs on a naze32 or flip32 board with some buttons, an oled display and an optional GPS. The firmware is meant to control a specific hardware setup with a continuous rotation servo with external gears for pan and a position servo for tilt. It uses the FCs (or an external) magnetometer to find the correct bearing, but without tilt compensation, so the tracker has to be horizontal. Since I wanted to use my existing mechanics, I had to jump through a few hoops to get it working. Without external gears, pan would run in the wrong direction and I used a feetech servo for pan, which is not supported, because it has a very narrow PWM range. So I put a KKmini board with openaerovtol in between, to reverse and slow down the servo. Once I got everything sorted, it now works without a problem. I have similar problem, servos not moving either moving the vehicle on the bench or fly the vehicle across the tracker at the field. Have been testing this AT for over 2 years (on and off) without success. Following are the details of my AT set up (AT “in the middle” configuration 2 in https://youtu.be/8GCqYTDYZaM, and http://ardupilot.org/antennatracker/index.html ). Also see the 2 attached screen capture, and the photo of my set up (on the bench only). After getting the servos moving, will buy 2 high torque servos and have them installed on a pan and tilt mechanism. •	APM2.6 flashed with AT v0.7 (also tried v0.8), and powered by 4.8 volt supplied to APM input pin set. •	Accelerometer (6 orientation) of APM calibrated. •	Compass, calibrated, connected to APM I2C port. •	Telemetry air module (A) connected to APM telem port for tracking vehicle position. •	Another telemetry air module (different Net ID) connected to APM UART0 pin set for link with GCS. •	GPS connected to APM GPS port. •	Pan and tilt servos connected to output of APM. 4.8 volt is supplied to APM output pin for powering the servos. •	A S500 quad, running on Pixhawk , with telemetry air module communicating with the air module (A) on the tracker. Link is established as witnessed from the solid green LED and other blinking LEDs. •	A laptop running Windows 7, MP v1.3.56. •	When everything is powered up, GPS 3D locked, 2 pairs of telemetry radio linked, right click on the tracker icon on the map in MP and select “Set Home Here” to set home location. •	Yaw range of movement is left at default, 360 deg. •	Servo testing is OK when pressing the “TEST” button after moving the slider to left or right. •	Yaw and Pitch gains are as shown on the attached screen capture. •	Only the tracker icon appears in the MP map. And I seeing both the tracker icon and the plane icon appear on your screen. Kyle, can you give more details on the Mission Planner ? In your set up, you get the tracker pitching up and down. Did it pitch in response to the plane motion? I don’t get any movement on the 2 servos. Pls comment on my set up and compare yours with mine. Appreciate if you let me know the differences between our set up. Thanks. Hi, when i hit auto it just pitched up and down, no response to aircraft movement. I walked the airplane left and right, back and forth, up and down, no tracking. -i’m using a regular Pixhawk on tracker and Pixhawk 2.1 on airplane. -My servos also tested fine and i’m able to move it in manual mode but no auto track. -I can see and switch between tracker and airplane on the “flight data” screen, upper right corner under the com port, using the drop down menu to choose between tracker and airplane for control. That’s all i can see, but once again, mine is not working so i’m still looking for a solution or someone to help! Where is the “auto” button that you hit ? Also, in the flight data screen, on top right hand corner, drop down menu under the COM port, I only got Antenna Tracker, no other port. My telem radio connected to the laptop MP is for pairing with one telem radio on the tracker, while the other telem radio on the tracker pairs with the radio on the vehicle. And I tried plugging another radio to another USB port in laptop at the same time, but the COM port in MP does not recognise it. Pls advise your radio telem set up. Did you arm the tracker in the “Action” tab under the HUD in MP ? HI, yes. Then i hit auto and it goes crazy. Frankie, hi, Set up like this. In fact, I connected the set up the same as yours before posting last time. Somehow no sign of servo moving. Later on, I don’t know what button did I push, probably the ARM/DISARM button in Action tab in MP, as soon as the telem radio in the vehicle is powered up, the tracker (Pixhawk) emits a sound to signify signal is received. Subsequent field testing, I can see the pitch servo moving as the quad increases in altitude. But the pan servo refuses to move even though I bring the quad across the tracker overhead. SO still have to figure out why pan servo is not moving. But I don’t have the tracker going crazy as you did. My servos are not yet mounted on pan and tilt system, just glued to a cardboard for bench testing. I don’t see the quadcopter in the drop down menu beneath the COM port because I was using APM2.6 as tracker. Once I switched to Pixhawk, I can switch between tracker and quad. I have been fighting my Antenna Tracker as well. I originally had an MP/Arduino solution working reasonably well, but I wanted to move to a standalone Tracker. I tried using AT-1.0 on the APM, but had no joy at all. After some reading it appeared that I was wasting my time with the APM, so I bought a clone Pixhawk “2.4.8”. I installed AT-1.0 (which is really AT-1.1) from MP and had a similar experience with “dead servos” which only came to life after doing a Servo-Test. Once armed and with live servos, the servos went nuts. I ended up setting the xx2SRV gains way way down to get the servos under control. The Tracker was usable, but I had to Servo-Test every time before engaging Auto, which was a PITA. I have since cloned the 2016 AntennaTracker-stable repository and compiled a genuine AT-1.0, which works reasonably well with the afore-mentioned low gain settings. I am still working out the wrinkles, but it looks like progress. Good luck! Thanks, when you get it working let us know. I put it in the corner until someone can tell me how to get it working, very disappointed in the lack of instructions, troubleshooting guides or help from any forums in general. Any help would be greatly appreciated by many, i’m sure! Thank you for the update. Pls see my layout of the AT v1.0 in the attached photo. The components are arranged on a cardboard. The bottom right hand corner (in white square) is another tracker which is MP GPS-based tracker, consisting only 2 servos and a Maestro servo controller. I just glue them on the same cardboard for easy field testing at the same time. The rest of the board is the AT v1.0 which I have been struggling on and off for nearly 2 years. In fact, I just ordered this pan and tilt kit yesterday from Readymade rc. It is backordered. 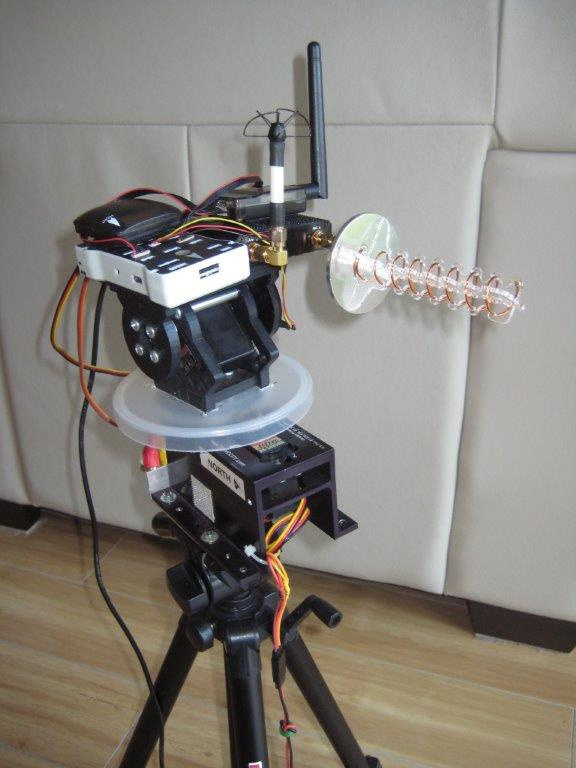 Can you show me your set up, such as what servos you are using, and the pan and tilt mechanism ? As for the AT v1.0, I have not much success with field testing. Once my quad and the tracker are powered up and telemetry radio link is established between the quad and the tracker, the tracker is armed. When I take the quad to mid air, vertical takeoff and flying across the tracker, the servos are all dead. But when I tried using SITL simulation on the bench, the PAN servo moved a limited angle, but not the TILT servo. The PAN servo is not 360 degree. I don’t understand how the “dead servo” only came to live after doing a SERVO TEST. How did you do the Servo test ? As soon as my tracker is armed, my servos did not go nuts, instead, both move back and forth once or twice before settling. Can you show me the value of your XX2SRV gains and all other related settings ? I just use the deafult settings of v1.0. How did you clone the 2016 AT-stable environment and compile a genuine AT 1.0 ? Can you share with me ? I am not a developer. Do we have to set the home location of the tracker in Mission Planner before testing ? Why is it AT 1.1? The version available for download is v1.0 in MP. I can change the screen between the tracker and the quad (in the COM port drop down on top right hand conrer of MP). In both screen, I constantly get “Failed to update home location” message. How do you get rid of it ? Q1. I don’t understand how the “dead servo” only came to live after doing a SERVO TEST. How did you do the Servo test ? A1. Manual, Auto, Scan, Servo-Test and Stop are the available Tracker Modes, which can be selected using the MP Actions tab. Select the desired Tracker Mode and press the Set Mode button. Using the CONFIG/TUNING Basic Tuning screen to test servos also forces the Tracker into Servo-Test mode. You can check whether the servos are armed by selecting the MP Status tab and sliding across the available data to find the CH1out (yaw) and CH2out (pitch) PWM values. When the servos are “dead” there are no PWM values. “Dead Servos” until you Servo-Test is an AT1.1 bug - It is not evident in AT1.0. With AT1.0 the servos only come alive when the Tracker detects the Telemetry link with the Aircraft. The Tracker will move left and right then stop until the Tracker receives good location information from the Aircraft. An Aircraft icon will appear on the MP FLIGHT DATA map when the Aircraft is visible to the Tracker. The Tracker will then attempt to point towards the Aircraft and maintain tracking so long as the aircraft is more than 5 metres away from the Tracker. Please note that the position of the Tracker and the Aircraft will drift up to 5 metres due to limitations in the GPS system. You can view the distance between the Tracker and the Aircraft at the lower right of the HUD display on the MP FLIGHT DATA screen. I needed to use Yaw_Trim to correct the calculated bearing of the Tracker. I also needed to offset the Pitch Servo Ranges from the Test Values to correct a Pitch calculation error. Pitch_Trim would not correct the error. Q2. As soon as my tracker is armed, my servos did not go nuts, instead, both move back and forth once or twice before settling. Can you show me the value of your XX2SRV gains and all other related settings ? I just use the deafult settings of v1.0. A2. The Tracker does not perform as described. The brief left and right move, followed by a stop is typical of “Aircraft telemetry received, but no GPS position available”. I discovered that my servos settled down once I had the servo directions right and corrected the bearing and pitch errors. My gains are: Yaw PID 0.1, 0.001, 0.0 IMAX 400, Pitch PID 0.1. 0.0, 0.0, IMAX 400. Q3. How did you clone the 2016 AT-stable environment and compile a genuine AT 1.0 ? Can you share with me ? I am not a developer. I can send you a copy of the AT1.0 firmware to test, which appears to be viable once the corrections are applied for the calculated Tracker bearing and pitch. Q4. Do we have to set the home location of the tracker in Mission Planner before testing ? A4. No. I have tried setting Home to avoid the Tracker GPS drift, but I could not get it to work. Q5. Why is it AT 1.1? The version available for download is v1.0 in MP. A5. I know that MP claims it to be V1.0, but I believe it to be V1.1. Q6. I can change the screen between the tracker and the quad (in the COM port drop down on top right hand conrer of MP). In both screen, I constantly get “Failed to update home location” message. How do you get rid of it ? A6. I have not found a solution to this yet. It is an annoyance, but it does not appear to affect Tracker operation once you have sorted out the yaw and pitch bugs. I have edited my responses. I hope this helps. Here is a video I made today testing 2016 AT1.0 on my ServoCity Pan-Tilt tracker head. I have not been successful duirng bench testing. Please help me during set up and testing on this actual tracker. By the way, what pan and tilt servos are you using, and what are the angles of rotation for the 2 servos ? Did you modify the servos to increase the angle of rotation ? I use Tower Pro MG996R digital servos with 13 kg-cm torque @4.8V. But as normal servos, they only rotate around 60 degrees which is not enough.